My interest in art started at an early age and I knew that art would always be a big part of my life. In 1997 I decided to turn my dream into a reality and opened my first studio gallery. Here I focused on wildlife art and portraiture. My love for wildlife and nature lead me to paint on location (plein air) in the Mckenzie district where my heart and passion lies. This enabled me to incorporate a plein air style into my studio work. Painting from life with a limited palette gave me a better understanding of colours in their natural environment. Now I paint using only primary colours. 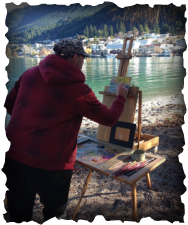 I am a keen outdoorsman, traveling around New Zealand finding inspiring scenery and wildlife to paint. I now specialise in wildlife, New Zealand birds, and pet portraiture as well as landscape painting. My skill set encompasses many mediums including acrylic, oil, water colour, pastel, sanguine, graphite and charcoal. My styles span across photo realism to impressionist. community college and various schools. In January 2016 I was lucky enough to be able to open my own art school. You can see the ArtWorkz page for more details.